India and Pakistan meet in the World Twenty20 on Saturday in what promises to be one of most fiercely contested and most-watched matches in cricket. Hosts India have never lost to Pakistan in the World Cup or World Twenty20, but made just 79 in a surprise defeat by New Zealand in Tuesday's opening match. Pakistan's campaign began on Wednesday with a 55-run victory over Bangladesh. They had threatened to boycott the tournament, and this match was moved to Kolkata after security concerns. Quiz: Are you an India or Pakistan superfan? An estimated one billion viewers tuned in to watch India and Pakistan's match at the World Cup in Australia in 2015 - which India won by 76 runs. Their rivalry is one of the fiercest in cricket. For India's Ravichandran Ashwin, it is even bigger than that between England and Australia. "This rivalry is huge, it's very hard to put a finger and tell you how huge. It's probably bigger than the Ashes," said the off-spinner. "As far as the Indians and Pakistanis go, I don't think they watch this game as a game of cricket. It's more of a border rivalry. They want to get one up on each other. "People put their emotions into the game. For the players, it's all about keeping their emotions aside and trying to play the best way we can." This match was scheduled to be played in Dharamsala, close to the Pakistan border, but was moved to Kolkata, almost 2,000km across the country near the border with Bangladesh. That decision came after threat of a Pakistan boycott, and the Pakistani government only sanctioned its team's participation after receiving safety assurances from the Indian government. The first Test series between the two teams took place in 1952, when Pakistan toured India, with India touring Pakistan for the first time in 1954-55. Between 1962 and 1977 inclusive, no cricket was played between the two countries because of two major wars in 1965 and 1971. The 1999 Kargil War and the 2008 Mumbai terror attacks also interrupted cricketing ties between the two nations. Writing on the BBC website, Indian parliamentarian Shashi Tharoor suggested cricket could help improve relations between the countries, an opinion shared by Pakistan coach Waqar Younis. "There is history between the two nations but also cricket history. We should take it as a sport," Younis said. "It's the most-watched game so we should all cherish that and feel proud of it. The way we have played cricket in the past 50 years it's a treat to watch for the world." Is an upset on the cards? India came into the World Twenty20 as tournament favourites, with 10 wins from their 11 previous Twenty20 games. However, the result against New Zealand shows they can be beaten and Pakistan will be buoyed by their own strong performance against Bangladesh. Pakistan have never won a World Cup encounter against their arch rivals in six 50-over meetings and four T20 games, but they have won all four previous limited-overs games against India in Kolkata. "We are a bit more confident this time. They will be under more pressure. We have won our opening game and lot of things going in our favour," added Waqar. But India's Ashwin is also confident. "I think if ever there is an international team that can put that opening loss behind, it is us," he said. "From here on if we go through we will be probably more dangerous than we were at the start of the tournament." How well do you know your India v Pakistan cricket? 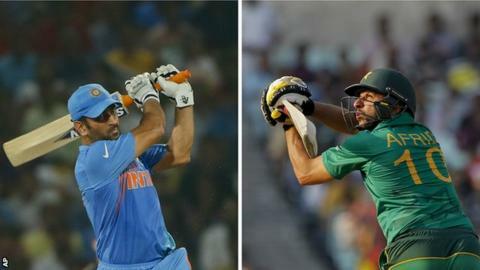 Read more on Viewpoint: Can India-Pakistan cricket promote peace?